My boys love when I make Ribeye steak in the oven, in fact, I’ve noticed that I get some extra chores and love out of them each time this meal ends up on our weekly menu. Cooking steak indoors may sound daunting but its actually super easy and it tastes better than grilling, in my opinion. Check out this simple and delicious Ribeye steak recipe below and give it a try. I know your family will love it. *This is a sponsored post in partnership with Omaha Steaks, however, all thoughts and opinions are 100% my own. Whether you live in an apartment, don’t own a grill, or maybe the weather is cold and rainy so grilling outdoors is out of the question- this ribeye steak in the oven recipe will save the day. In the past, I solely grilled my steaks because that is what my father had always done. I honestly didn’t even know steaks could be cooked in the oven, to be honest. Then a good friend who was helping me in the kitchen over the holidays noticed I was waiting to cook my steak until the salmon was done on the grill and he jumped in to tell me how the best steaks are seared and finished in the oven. I was hesitant to believe him but with a house full of hungry guests I was willing to give it a try. Turns out he was right! Oven cooked steak is DELICIOUS!!! I really believe once your try this Ribeye Steak in the oven you’ll never want your steak cooked any other way. The Key to a Great Tasting Steak is QUALITY!! Now before we get into this amazing recipe let’s talk steak quality. In all my years of cooking and grilling steaks, there is one key aspect that is really important and that is purchasing quality steak. I have always trusted Omaha Steaks when it comes to finding a consistent high-quality cut of meat. Plus, the fact that I can order exactly the cuts I want and have them delivered, flash-frozen after carving to my door without ever leaving the house is pretty awesome too! Ribeye has been my family’s favorite cut of steak for years thanks to its delicious buttery taste and its tender bite. It’s definitely the star of the show in this Ribeye Steak in the oven recipe. They have a brand NEW Omaha Cut Ribeye that is just superb! The butchers at Omaha Steaks hand-carve & carefully trim their Ribeyes so that they are thicker and so that they cook more uniformly than standard-cut Ribeyes. This exclusive cut can only be found at Omaha Steaks and once you taste them, you’ll never want to buy your steaks anywhere else. You can thank that intense marbling for the added boost of flavor. Try the Exclusive Omaha Cut Ribeye here for under $10 per steak. Plus, you can view Omaha Steaks value packages here for even better savings on all sorts of protein including some of my favorite fish!! Cooking a ribeye steak in the oven is simple and only requires a few ingredients. an instant-read meat thermometer– this one is affordable and works great!! an oven-proof skillet- this cast iron pan is the most used pan in my house. tongs to flip your steak- OXO has been my choice brand for years, grab them here. 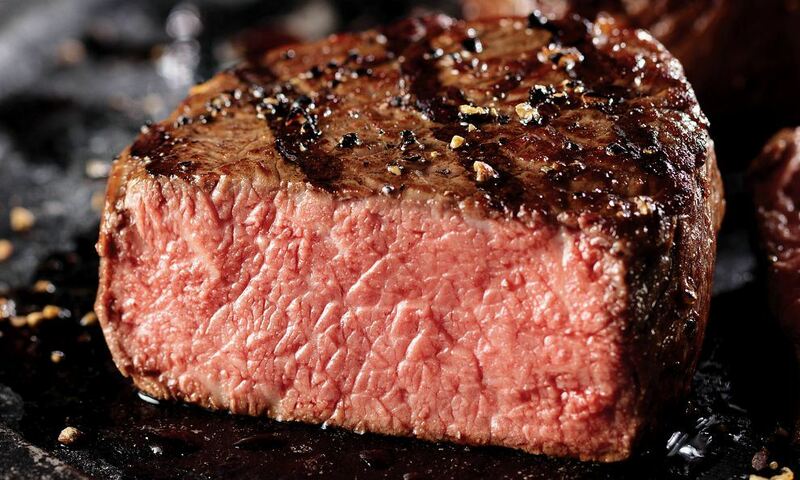 One of the keys to great tasting steak is getting it to room temperature before cooking. I recommend setting your steak out for 30-45 minutes prior to cooking. Next up, season your steak. First blot the steak with paper towels, next brush the steak lightly with avocado oil and sprinkle with your seasonings of choice. I recommend going light on the seasoning especially if you purchased quality meat. It doesn’t take much to make it taste great! I listed my favorite seasoning combo in the ingredients list but feel free to sub in your own. Preheat your broiler and your skillet next. You’ll want them both to be very hot before you begin. Once the skillet is ready (usually after about 5 minutes) go ahead and sear your steak. *Be careful because the avocado oil will splatter. Gently press the steak down and let it cook for about 30 seconds. Then flip and repeat on the other side. Once your steak is seared on both sides you will want to quickly pop your over-safe skillet into the oven to broil. This is where the Ribeye steak in the oven magic happens!! Broil the steak for about 3 minutes per side. I listed the doneness temperature readings below to help you. 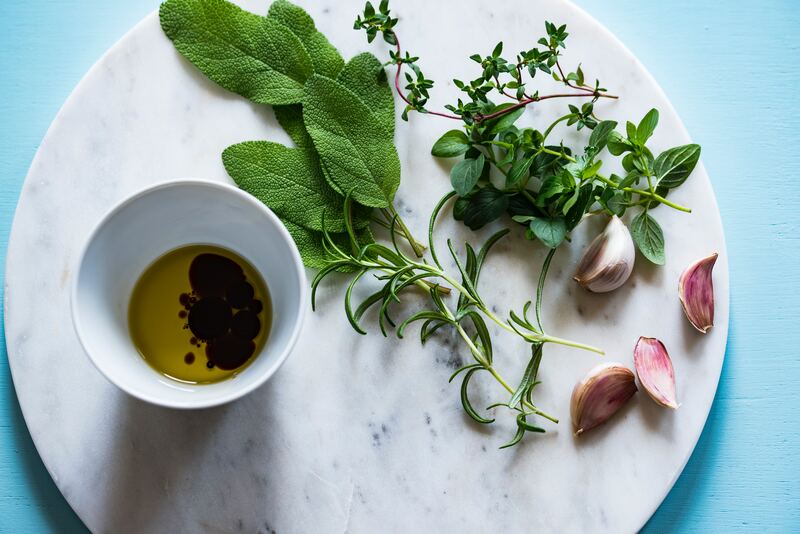 Serve with a pat of grass-fed butter and sprinkle with fresh thyme. 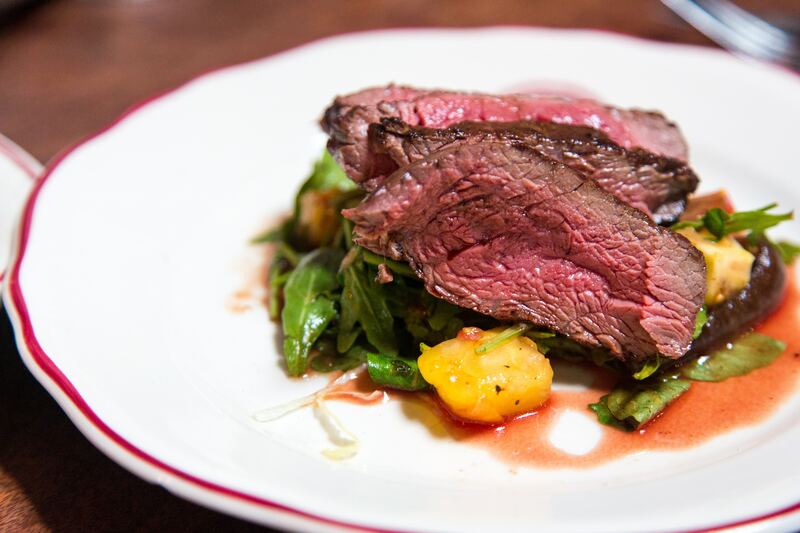 This steak tastes great on top of a bed of greens with some red wine vinaigrette and chopped fruit (peaches, cherries, mango- whatever is in season). You can find cooking charts here to let you know when your Ribeye steak in the oven is done to your liking. You can also find even more great Ribeye & steak recipes on the Omaha Steaks website here. Have you tried cooking Ribeye steak in the oven yet? ?